Originally published in Bryologist 89: 70-72. 1986. Copyright © 1986 by the American Bryological and Lichenological Society, Inc.
Abstract. Didymodon australasiae var. umbrosus (C. Mull.) Zand. is reported from an established site in the Niagara River Gorge, New York State, U.S.A. This disjunct station may be due to chance importation through a nearby botanical garden. A fourth U.S.A. collection from the state of New Mexico is also reported. While preparing a flora of the American and Canadian sides of the gorge of the Niagara River, I discovered an unusual pottiaceous moss that defied identification with manuals written for this part of the continent. This moss grew in one of the numerous seeps that occur on both sides of the river on the dolomite stratum that runs along the lip of the gorge. Associated vascular species were Sedum ternatum L., Thuja occidentalis L., and the rare but locally frequent fern Pellaea glabella Mett. Associated bryophyte species were Barbula unguiculata Hedw., Hymenostylium recurvirostrum (Hedw.) Dix., and Didymodon rigidulus Hedw. var. rigidulus. The latter two species are frequent in these seeps and closely resemble the moss in question. However H. recurvirostrum is distinctly papillose in the Niagara Gorge stations, with half the leaf lamina on at least some leaves recurved, fiexuose, or both, whereas the leaves of the new moss are smooth with erect margins and broadly channelled in cross section. Like D. rigidulus var. rigidulus, the new moss has a fleshy leaf tip due to the excurrent costa, but the former species has a narrower lamina, erect-spreading leaves, and, most importantly, yellowish, evenly thickened cells across the base of the leaf. The most striking feature of the discovered moss was the medial inflated, hyaline cells at the leaf base. In older, more robust stems, these cells were ruptured or resorbed, and the strongly reflexed leaves are a good field character. Richard Zander suggested the specimen might be compared with Didymodon australasiae (Hook. & Grey.) Zand. var. umbrosus (C. Mull.) Zand. (=Trichostomopsis umbrosa (C. Mull.) Robins., as it is currently understood by European bryologists). Harold Robinson (in lift.) indicated that, although the specimen I sent him was depauperate, it might well be as Zander suggested. Subsequent searches through additional collections made at the same station have produced more robust material, and it is on this basis that I concur with the opinions stated above. I am following the taxonomic concept of Zander (1981). Plants bright green; stem hyalodermis present; costa not as flattened as in typical var. umbrosus material, but not as round as in var. australasiae; leaves broadly channeled, long-lanceolate with a narrowly acute apex—the fleshy tip being absent to fully developed in leaves on the same stem; leaf lamina broader than in typical var. umbrosus; at least some of the leaves always broadened into an ovate base to accommodate larger and inflated basal cells; leaves bent back into an almost squarrose posture at the transition of basal and limb cells; occasionally the marginal cells appearing toothed by depression of the central area on the outer margin of the cell itself; adaxial costal cells overall rectangular; cells of the upper lamina rounded quadrate. Although the leaves of var. umbrosus are smooth to somewhat papillose, there is good development of papillae on the leaves of this specimen. The median basal cells are enlarged and weakened to ruptured or not coming away at all in dissection. Zander (1981) referred to "transverse slits in the medial basal portion of the leaves on both sides of the costa of some specimens of D. australasiae var. umbrosus . . . (as) resorption channels reaching across several cells and perforating the leaf" in the manner of Kingiobryum paramicola Robins. (Robinson 1967; Zander & Cleef 1982). This characteristic is not apparent in the material from the Niagara Gorge, in which deterioration of the basal cells seems due to fragility. Rhizoidal tubers mentioned by Zander (1981) and figured by Crundwell and Whitehouse (1978) were evident in the present material. Only archegoniate plants were found at the Niagara station. FIGURES 1-7. Didymodon australasiae var. umbrosus (C. Mull.) Zand. — 1. Habits, wet. — 2. Upper stem leaves — 3. Areolation of leaf tip, side view showing thickness. — 4. Areolation of leaf tip, adaxial surface. — 5. Areolation of leaf base showing area of thin walled, hyaline cells. — 6. Mid-leaf cross section. — 7. Tuber. — Scale bars: a = mm (Fig. 1); b = 0.5 mm (Fig. 2); c = 20 µm (Fig. 3-7). For discussion of generic dispositions of the taxa, see the papers of Zander mentioned above and Robinson (1970). For description of British material and citation of specimens for Britain, see Crundwell and Whitehouse (1978). Didymodon australasiae var. umbrosus is endemic to the New World, being known from Mexico (Delgadillo & Zander 1984) and South America, with an occurrence in California (Los Angeles Co., Robinson 1970) and New Mexico (Ireland 1984). I have recently collected an additional record for New Mexico (cited below), the fourth record for the U.S.A. For additional stations worldwide and discussion, see Crundwell and Whitehouse (1978). The occurrence of this species in New York is unexpected. The present gorge of the Niagara River is a postglacial development, and is as recent as 10,500 years where the gorge initiated at its northern terminus (Tesmer 1981). The specimen was collected 11 km upriver from the face of the Niagara Escarpment at Lewiston, New York, and Queenstown, Ontario, hence, the age of this station must be at least half of the estimated age of the gorge. Since the disjunction with stations in the American southwest is extreme and the Niagara Gorge is relatively youthful, relictual considerations accounting for such a description of its range seem untenable. Specimens examined: Didymodon australasiae (Hook. & Grev.) Zander var. umbrosus (C. Miill.) Zand. U.S.A., New York State, City of Niagara Falls, Whirlpool Street at the lower arch bridge, under Robert Moses Parkway overpass, upper path along rim of Niagara River gorge along dolomite caprock, in seepage along vertical dolomite wall, thin soil, 9 March 1985, Eckel 231385 (BUF, herb. P. M. Eckel, us). New Mexico: Eddy Co., on NM Rt. 137, 5 miles S of jet. with US 285, roadside, crevices of lava outcrop, limestone region, xeric, with Cheilanthes, Opuntia spp., with Didymodon revolutus, Pseudocrossidium aureum, Didymodon rigidulus var. rigidulus, 11 August 1985, Eckel 231685 (BUF). I would like to thank Drs. Richard Zander and Harold Robinson for their advice and encouragement with respect to this specimen and its report. The Niagara Reservation Commission of the New York State Department of Parks, Recreation and Historic Preservation, USA, and the Niagara Parks Commission, Ontario, Canada, have kindly granted permission to conduct research in the gorge of the Niagara River on both sides of the international boundary. CASAS DE PUIG,C. 1970. Trichostomopsisumbrosa(C. Mull.) H. Robinson en la ciudad de Barcelona. 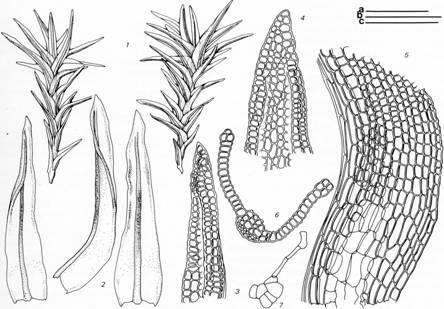 Notulae Bryologicae (1-111) Acta Phytotaxonomica Barcinonensia 6:1-22. CRUNDWELL, A. C. 1985. The introduced bryophytes of the British Isles. Bulletin of the British Bryological Society 45:8-9. — & H. L. K. WHITEHOUSE. 1978. Trichostomopsis umbrosa (C. Muell.) Robins, in England. Journal of Bryology 10:5-8. DELGADILLO M., C. & R. H. ZANDER. 1984. The mosses of the Tehuacan Valley, Mexico, and notes on their distribution. THE BRYOLOGIST 87: 319-322. IRELAND, R. R., S. S. TALBOT & T. K. TODSEN. 1984. New or rare mosses of New Mexico. THE BRYOLOGIST 87:255-256. ROBINSON, H. 1967. Preliminary studies on the bryophytes of Colombia. THE BRYOLOGIST 70: 1-61. —. 1970. A revision of the moss genus, Trichostomopsis. Phytologia 20:184-191. TESMER, 1. H. (ED.). 1981. Colossal Cataract. The Geologic History of Niagara Falls. State University of New York Press, Albany. ZANDER, R.H. 1978. New combinations in Didymodon (Musci) and a key to the taxa in North America north of Mexico. Phytologia 41: 11-32. —. 1981. Didymodon (Pottiaceae) in Mexico and California: Taxonomy and nomenclature of discontinuous and nondiscontinuous taxa. Cryptogamie, Bryologique Lichenologique 2:379-422. — & A. M. CLEEF. 1982. Taxonomy and ecology of Kingiobryum parmicola (Dicranaceae, Musci). Studies on Colombian cryptogams. XVI. Proceedings of the Koninklijke Nederlandse Akademie van Wetenschappen. Series C. Vol. 85: 627-634.